Chris just put these up on his site and with the price point, and a Chris Baird build I just hadta have one! Adi top, Walnut back, side, AND neck. Should be interesting, and fun! It needs to rest a couple more days, then Chris will give it a final set up. Then, on it's way to me. Gorgeous! I love that walnut back. I have been drooling over these, too. It would be a nice companion to my Arches A. Hmmm. What can I sell? Absolutely beautiful. I can see why you fell for that one. Of course, we need a full sound report, especially with the combination of A oval, red spruce and walnut. I would be really interested in knowing the result of those. Nice Gerry. I'd like to hear your report as well. If I hadn't just picked up an oval hole A, I would have sprung for one of those babies. That's a great deal on an Arches! I'm glad to see luthiers offer more affordable options in this economic climate. Wow! 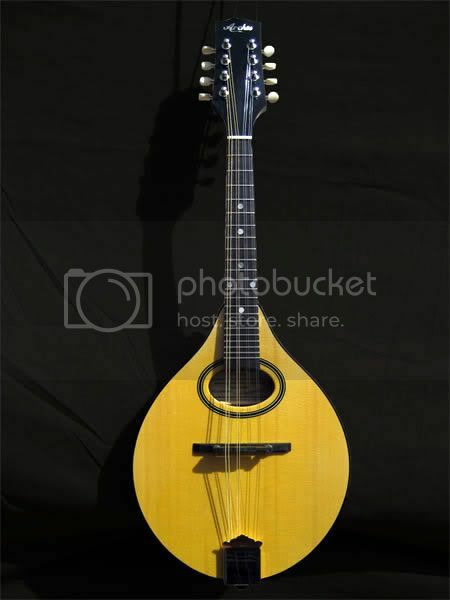 That mandolin looks great! The walnut is beautiful!! It is taking great restraint for me to not hit the BUY IT on one of those. They look amazing, especially considering the price!! Gerry, I think we're going to need to do a VA Mando Tasting soon. Congratulations. Those look great. It was his closed down list that led me to my Spira, so no regrets. I'm really looking forward to a review of the re-vamped Arches Flat top instruments. Thanks everyone! I'm pretty excited, as we all are when we get our new 'Babies'! I'll definitely get a player report up as soon as I have her here. Shaun, I'm thinkin' we're about a month away from the time when us West Ender's start looking to make a Weekend Beach Run to escape the weather. A Tasting Session would certainly be in order. Spoke with Chris on the phone this A.M. He's a great fella. Very insightful and really likes to keep traditional design's (with more modern building tools, of course) in his builds. This affordable line looks to be a great way to allow someone (like me) the chance to get into a really nice instrument, and not break the bank. Looks like one of the best deals going to me. That is really nice. Folks, go look at the other ones, too! Chris is offering some splendid wood choices, not ust the same ol', same ol' !! San Francisco, CA or forgotten East Galway, take your pick. Congratulations - that walnut back and sides one really caught my eye, as did the one he as up with cocobolo back and sides. I'd be all over that cocobolo one if I hadn't just gotten my Weber. Looking forward to hearing your report back on your one once it arrives. Steve, Thank you, Sir! These little pups look like they might hold their own in a seisiun, don't they? Chris told me he was very happy with the way they came out as far as having really good punch, and volume. Jill, again, thanks! Yes, the cocobolo and the walnut were the two I liked. The cocobolo was already gone when I called him. So, that made the choice that much easier. I guess you can still order any of them. I didn't ask him how long it would take to get one, but he did say these were relatively easy to build. So, I wouldn't imagine it taking too long. I'm kinda wondering how one would actually classify this design: It's a Flat Top, yet there is an induced arch due to the bracing. Do other Flat Tops actually have some small amount of arch to them? The only other Flat Top I've owned was a Trinity College OM. It's top was as flat as a pancake. I am sending him a set of FT74's to set it up with. All of those instruments with thier wide variety of woods will satisfy the tastes of nearly everyone. Of course the craftsmanship and tone will deepen the love for Chris' work and engender brand loyalty. Speaking from experience, you get the total package from Chris. My Gibby, though a fine instrument, is my backup now. Best to you Gerry. You are about to have a grand experience. And thanks to Chris for making so many people happy. '07 Arches A Style #11, "Hoss"
... as long as you just go ahead and click that 'Buy It Now' button on that Zebra! I ordered up the birds-eye version. Can't wait to receive it. 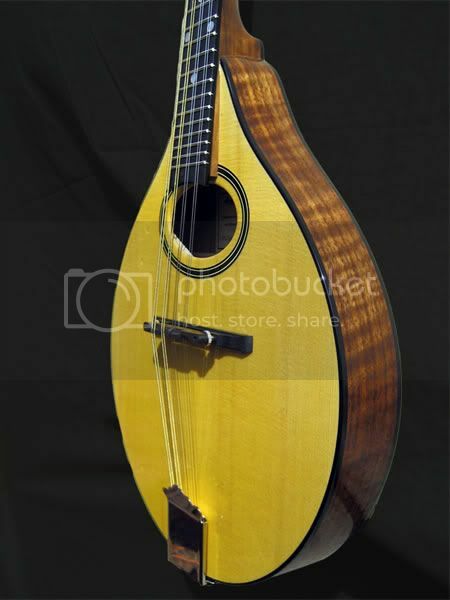 Right after I ordered it I found that Don and Josh Paine (Pomeroy Mandolins) are offering up a resonably priced flat top as well. I like the shape of the Arches one better. Very cool. I think they both look pretty cool, actually. Although, my first impression of the Pomeroy I thought they looked a bit like a Trinity College instrument. To my eyes, the induced arch in the Sobell is much more evident. I've never really thought of a Sobell as a flat top. Of course, that could just be my eyes! The Pomeroy family, and Mr. Baird could be starting off a really cool trend here. 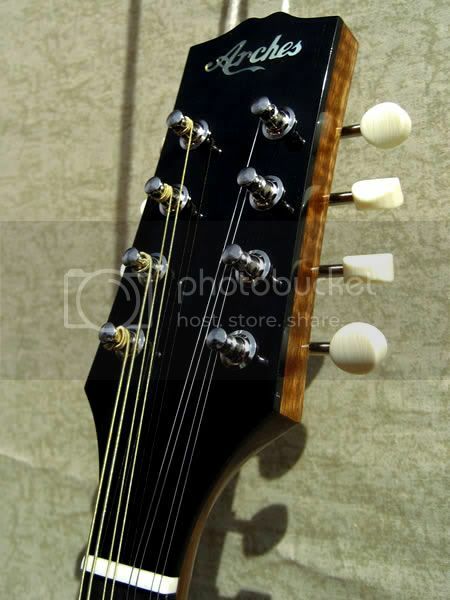 Really nice, handmade instruments with a very attainable price. Of course, we musn't forget the Big Muddy folks, and I'm sure there are a couple-to-few more out there I'm forgetting to mention that were already there. Yeah, I see the TC similarity as well. When I said Sobell-ish, I was thinking of the width of the bout and the taper to the neck. I guess a little more TC-ish than Sobell-ish based on the flat top. Doesn't Peter Ostroushko use an Arches A Oval? In a recent comparison walnut and red spruce turned in a the winning performance. You were ahead of the curve. Congratulation on a one of a kind and beautiful mandolin. Gotta give a mention to Steve Smith and his Redline Traveler mandolins - if we're talking about American made mandolins with a good price point then the Travelers should definitely make the list! Al: Thanks! Yes, I have a feeling my giving in, and pulling the trigger on this one is going to be very good thing! How could I forget Walt, and his Gypsies'? Definitely a nice instrument at a GREAT price. Chuck, I'm not sure if Peter plays one, or not. Maybe, Chris can tear hisself away from his workbench for a couple minutes and answer that for us? It's exciting to hear the Adi Red / Walnut combo did well in the comparison. Chris told me the combo was the loudest of all of the first run he put together. I play ITM and Contra Dance, so the extra volume will be nice. Jill, I have been watching your build thread and the Red Lines definitely are there! As far as the trend I was mentioning it wasn't necessarily meant to be US made only. I was talking more about the shops that can run up into the $4K-$8K + range for their top shelf instruments actually using their same skill and materials to make a more affordable line. Much like what Chris is doing with Arches, and the Pomeroy's with their new line. Congratulations on your stunning new mando! I think that clicking the "Buy it" button on those mandos is totally understandable, I look forward to reading your review when you get it. What about the Silverangel Economandos then? 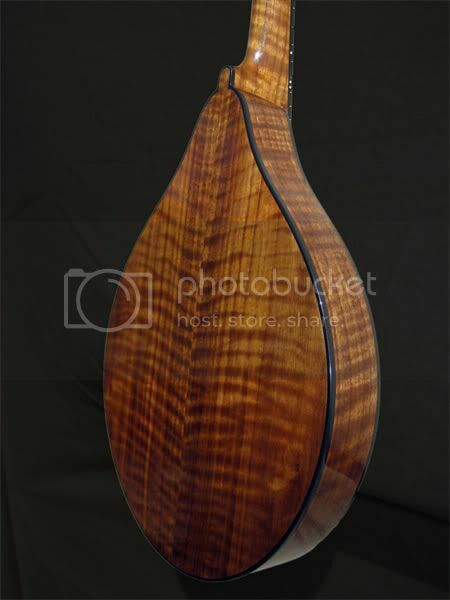 I'm more of an oval hole fan myself, but I certainly wouldn't mind adding one of them to the fold (and a Cocobolo Arches as well!!). Swinging back to the praise of the Arches mandolins, I'm really looking forward to seeing what the new carved top line looks like as well! All times are GMT -5. The time now is 3:33am.